The Canadian Music Collective Broken Social Scene play possibly the most gorgeous venue to appreciate live music in Seattle (The Paramount Theatre) this Friday October the 15th, 2010. All a whole the BSS catalog provides beautifully baroque, sonic landscapes perfect for fall. 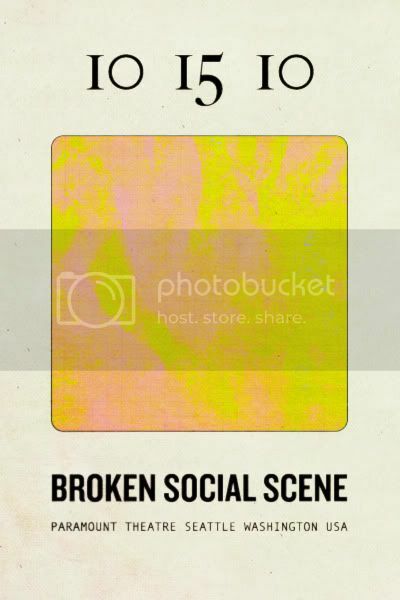 Broken Social Scene's 2002 Masterpiece You Forgot It In People, has held a consistent spot in FYM's weekly record listening rotation, ever since we heard Anthems For A 17 Year Old Girl. Needless to say we are stoked about seeing BSS live for the first time in such a luxurious venue! The groups latest solid a-la-carte showcase of Canadian indie talent, 2010's Forgiveness Rock Record was produced by John McEntire of Sea and Cake (who happen to be currently on tour with them). AND keep an eye out toward the end of the month as Broken Social Scene/Sea and Cake release a 7" split together. FYM will be on the scene this Friday in Seattle, so hit us up on twitter.